Madagascar is a really special place. It is an ancient island, adrift in the Indian Ocean. Much of it is unlike anywhere else on Earth. Scientists believe the island was once part of a place called Gondwana, a kind of super-continent which included both Africa and India. Madagascar and India broke-off from Africa as a single continent. 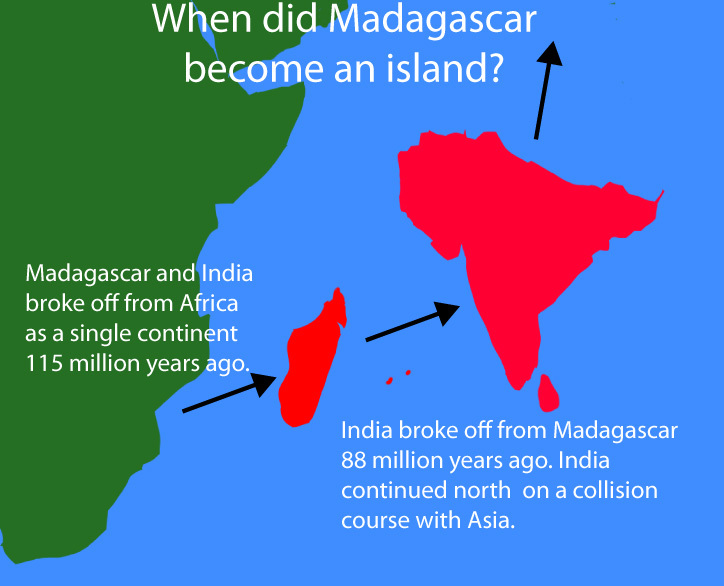 Later, scientists believe, India broke away from Madagascar. East of the mountains, Madagascar has significant rainforests. They exist because the mountain tops prevent warm tropical winds, blowing-in from the Indian Ocean, from dispersing over the whole island. The winds are trapped, on the eastern side, resulting in lots of rain and lush forests (which are home to all sorts of interesting insects, birds and animals). Here, in a place which resembles a “lost world,” five meters (16.4 feet of rain) can fall in a year. On the other side of the mountainous spine, Madagascar's weather is very dry. The western area has its own interesting array of plants, birds, animals and insects. Some are found nowhere else in the world. Here, scorching-hot days and bitterly cold nights create extreme climates. Lemurs are one type of animal living in those extreme climates. Based on the Latin word for “ghost” or “spirit,” lemurs live in the desolate, windswept lands of Madagascar’s western area. They huddle together at night in a place where drought-loving plants live. When there is no rain, such plants provide the only moisture (unless fog, condensing on leaves, provides water). Ring-tailed lemurs (Lemur catta)—whose tails are longer than their bodies—are endemic to Madagascar. Vocal primates, they are able to jump from tree to tree. Females typically produce a single offspring. Among other things, ring-tailed lemurs eat ... dirt! Scientists think that process adds sodium to their diets (plus it protects them from “gut parasites”). Lemurs in the wild tend to live between 15-16 years. Among their predators are Madagascar buzzards. Human development, of lemur territories, can also be disruptive to these animals. They can become marooned, for example, by farmers with their rice paddies. The same is true all across Madagascar’s eastern mountains where each peak is like its own ecosystem (featuring its own collection of plants and animals). This clip, narrated by Sir David Attenborough, is from the BBC series "Madagascar," episode 2 - "Lost Worlds." It highlights some of the interesting features found on the Earth's fourth-largest island which measures 226,917 square miles (587,713 square kilometers). Clip from the BBC series, "Madagascar," Episode 2 - "Lost Worlds," presented by Sir David Attenborough. Copyright, BBC, all rights reserved. Clip online via BBC Channel at YouTube and provided here as fair use for educational purposes. Bos, Carole "Madagascar - Life in the Rainforest" AwesomeStories.com. Apr 06, 2014. Apr 26, 2019.